Well it was a full house for Taree’s “Meet The Candidates” . . . What a show! What a line-up, spread across the stage behind a long trestle table, a bit like the Last Supper. Given that heart disease is the number 1 killer in both men & women world wide, with those over 60 being the most vulnerable, the Lyne electorate having the oldest average age in Australia, the heart attack outcomes in this area being the worst recorded in Regional Australia. 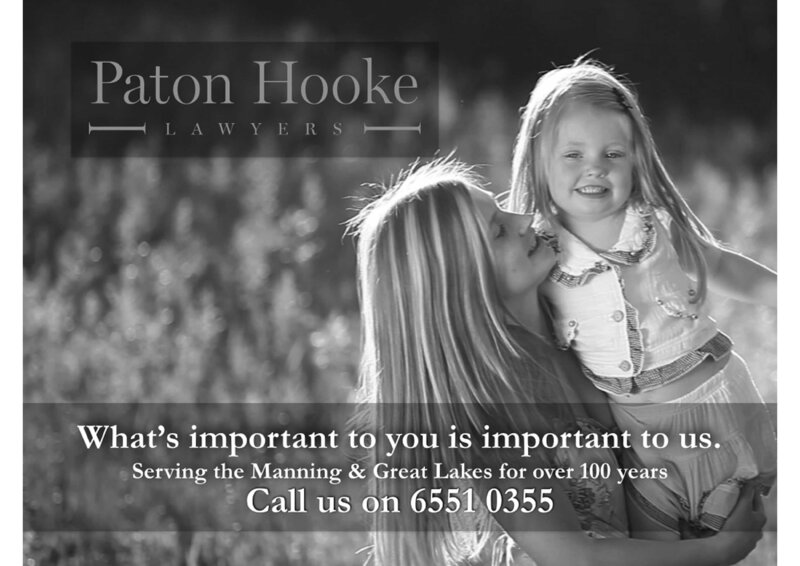 Would you explain what steps you would take if elected, to ensure that a Cardiac Catheterisation Laboratory, which is a vital and life-saving service, is established at the Manning Hospital in the next term of Parliament. And with some of the newly constructed hospital building under utilised due to staff shortages what would you do to rectify the situation. 1.Do you personally believe in the science of human induced climate change and the need to significantly reduce greenhouse gas emissions? If yes, what means will you propose or support to reduce emissions? If no, will you still support measures to reduce greenhouse gas emissions? 2. The NSW State Government is supporting the further degradation of the remnant native forests in our electorate to provide timber pellets known as “biomass” to burn in power stations both in Australia and overseas. Given its impact on koalas, other threatened species and the increased demand on limited forest resources, will you support this new industry? What assurances will you provide that the flow of capital funding from the state government addresses the challenge this LGA has in meeting infra structure back log. 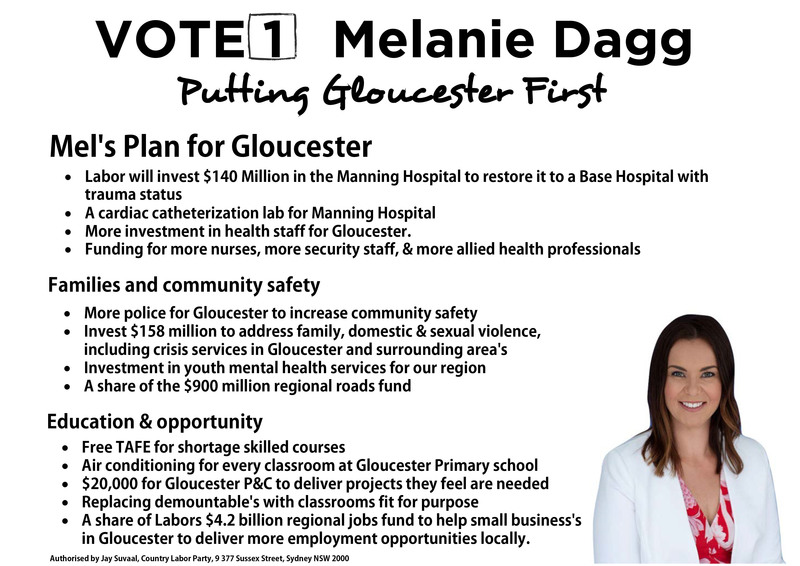 And would you support a plebiscite on de-amalgamation of Midcoast Council? Every year, in Australia, the killing of women and children by violent, controlling, homicidal males continues unabated. According to (BOSCAR the Bureau of Statistics, Crime and Research) the violence costs the Australian economy $22 billion a year. So far in 2019 – From January 1st to today`s date, men have killed 11 women. And a 6 month old baby boy who was brutally bashed in February-a 28 year old man is in custody in Newcastle. What do you think needs to happen to stop this carnage of Australian women and children by the very men who should love and protect them? The candidates had 2 minutes to answer and took it in turns to go first. Mrs Elliot, a down to earth woman from a commercial fishing family, understandably had a lot to say about the demise of our commercial fishing industry. Off this topic, while she was pleasant and sensible, I don’t think she gets out much, or reads The Manning Community News or listens to current affairs. We didn’t expect our candidates to be up to the calibre of a political analyst, but a bit more local background knowledge in some cases on other aspects affecting the community might have gone down well. 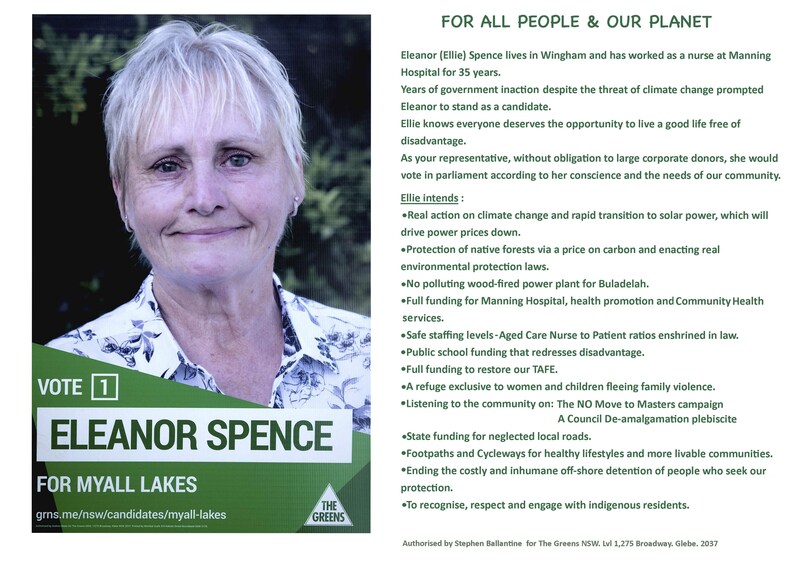 Paul Sandilands and Eleanor Spence, an Independent and the Greens Candidate, were on sure and informed and passionate ground when talking of hospital and women’s refuge concerns, as they both work at the hospital, Eleanor as a nurse, Paul as a midwife. Again, they waffled a bit when discussing unfamiliar territory. Our incumbent, Mr Bromhead, had no such qualms and seemed to rarely pause for breath, launching instantly into long jumbled facts and figures and “we’ve done this and we’re doing that, and we’ll be funding lots more.” His comments were frequently booed, even shouted down by the audience. His strategy seemed to be to bulldoze through with figures and promises and resting on laurels, hoping to blind us with National Party achievements. The mob wasn’t having it. Nor was Dr Keegan beside him who clutched his brow and rolled his eyes, as easily disputed facts and figures tumbled from Mr Bromhead. Especially when it came to reinstating the Women’s Refuge in Taree, which, since being taken over by the Samaritans, has gone from being a safe haven for women in crisis at any hour of the day or night, 7 days a week, to a business 9-5 Monday to Friday. The Samaritans have a closed door policy which means if a woman knocks, even in business hours, the door is not answered – contact is by appointment only. They expect terrified, traumatised, possibly injured women and sometimes with her kids, to make an appointment??? Homeless men also get services from the Samaritans, but are not housed with the women. While Mr Bromhead insisted the refuge was available any time, shouts from the audience didn’t deter him. Dr Keegan passionately put him in his place as he talked of trying to help battered woman at 1am to find refuge other than a lonely temporary room in a motel. ‘Not Good enough,’ thundered Dr Keegan. Mr Bromhead didn’t flinch at any of the shouts or contradictions. The man must have been wearing a teflon undershirt. Leonie McQuire, spokesperson for ROR – Restore Our Refuge, points out that (at the time of going to press) twelve women and a baby have been murdered in Australia so far this year. After an hour of them each struggling through the prepared questions, one couldn’t help but reflect that with few exceptions, the candidates spoke their bit, but seemed not to answer the key part of the questions which were – How would you handle this… What would you do . . . What solutions do you have for . . .? This all took one hour. Now it was time for questions from the floor. A line of about two dozen or more people had formed behind the microphone, clutching sheathes of paper or notes. Valiantly Mr Carter requested they ask one short question, no more than a minute duration, which was ignored as everyone wanted to say their piece, make a statement, give their viewpoint or their gripe, and then ask a question. All questions with one exception were directed to Mr Bromhead. But this was an audience most of whom had come armed with facts, paperwork, charts, figures, and personal anecdotes that were impossible to refute. Mr Bromhead bulldozed on however, despite some questioners brandishing reports and documents to the contrary. 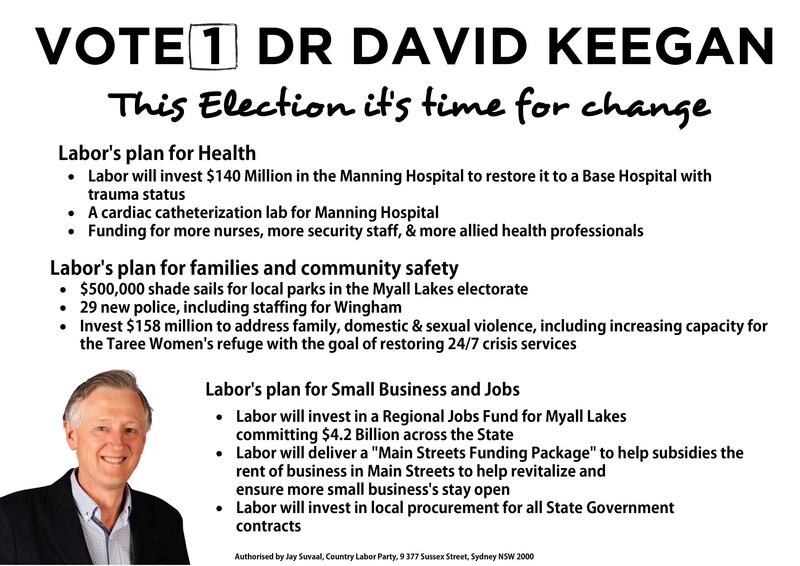 Alan Tickle, leader of the Hospital Action Group furiously waved a copy of the Hospital Re-development plan and pointed out that stage 1 of the plan is made up of parts 1a to 1d of which only a fraction has been completed, yet the Member for Myall Lakes is already touting funding for stage two. He called for undertakings from the candidates, that apart from the need for appropriate scoping of the re-development, that there would be a review of the administration of Hunter New England Local Health District. The action group have also been a keen advocate for a Cardiac Catheterisation Laboratory and an MRI to be included amongst their lists of priorities. The final person in the line of questioners, was the steely calm, fully armed Dr. Sesh Narasimhan, our one and only cardiologist, who has been fighting for years for a Cath lab. As the former Chair of the Manning Hospital Medical Staff Council and former Director of Medicine, he has recruited a few specialists to Manning Hospital (Dr. Krishan Gupta-Respiratory & Sleep Specialist, Dr. Sathya Nookala-Geriatrician, Dr Mustafa Majeed-Manning ED Director & Dr. Rob Hislop-ICU Specialist). To Mr Bromhead’s claims of “overseeing” recruitment of specialists, Dr. Sesh clearly explained that the recruitment of doctors to any public hospital in Australia is done by the particular area health service and no politician has any influence over this process”. He further reminded individuals to stop claiming for things they have not helped with or done. Mr Bromhead kept referring to what they’ve spent, what HE got us, and dangling the endless promise of Stage 2. Dr. Sesh then sensationally told us all that no one in Hunter New England or the medical fraternity working in Manning Hospital is aware of Stage 2 and there is no formal communication received to explain what Stage 2 is! He further told us that he has been having an unresponsive dialogue with the sitting member, Stephen Bromhead, for seven years and again reminded him to stop taking credit for hospital specialist appointments when in fact politicians have no role in hiring staff. Mr. Bromhead proudly stated “a fantastic doctor from RPA” who works in Manning Hospital ICU. Very calmly, Dr. Sesh responded, “For your information, the specialist in ICU that you are taking credit for bringing to Taree, has indicated that RPA Doctor is now headed to Port Macquarie.” Further more Dr. Sesh has informed us that 5 of the 7 Emergency Department Specialists have left Manning Hospital! Mr Bromhead quickly changed tack exhorting his proposal that there would be a wonderful hospital built in Forster. Dr. Sesh informed all of us that promising a public hospital in Forster is a bad idea as this will cause dilution of services. He was clear in stating that Manning Hospital needs to be upgraded to support the community and the “false hope” of a public hospital provided by Mr Bromhead to the Forster community is both morally and ethically wrong. Mr Bromhead has been officially told by both the CEO of Hunter New England and the Manning Hospital Medical Staff Council that there is NO SUPPORT for a public hospital in Forster. 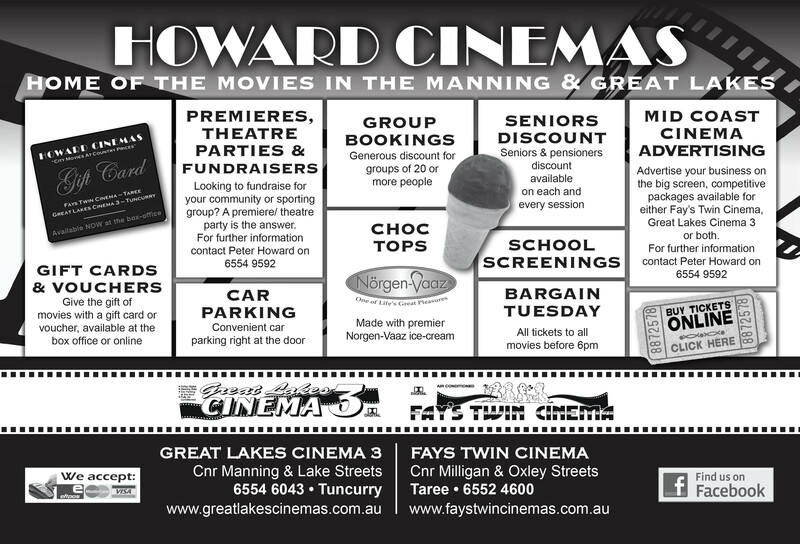 So it seems Forster will get some extra services attached to what’s there already. No millions and millions of bucks for a glossy new hospital in sight. Sorry Forster. And the downgrading of Manning Hospital by John Hunter continues. Some of us sat there in something of daze wondering if we’d been transported to a parallel universe. Many in the room were seething. Or laughing and shaking their heads. I would suggest all the candidates take note; when you step into the ring, be prepared for blazing torches and fireworks. Oh, and telling a porky or two, if you do, in public or on forms, is not a good look. So What Is Manning Hospital REALLY going to get?